Union Douala, the champions of the Cameroonian MTN Elite One 2012, has several interesting players. One of the revelations of the season has been Vincent Mbarga Manga who has been particularly impressive during the second part of the season. My first record of Mbarga Manga is from the MTN Elite Two 2008-2009, the second level of Cameroonian football. At the time, Mbarga Manga was a key player for Renaissance FC de Ngoumou. 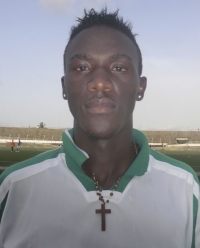 Towards the end of the season, Mbarga Manga was picked in the squad of the Cameroon U-20 national football team. Renaissance FC won promotion to the MTN Elite One after the season. As far as I know, the MTN Elite One 2009-2010 was the first season at top level for Mbarga Manga. Renaissance FC made a mid-table finish and Mbarga Manga forced his way into the squad of the Cameroon B national football team. At the time, Mbarga Manga was widely considered as one of the revelations of the season. After the season, Mbarga Manga joined the more ambitious Union Douala. He scored in his debut on 13.11.2010 and played regularly during the first part of the season. Mbarga Manga rarely featured during the second part of the season, possibly because of injury. Mbarga Manga returned to the first eleven of Union Douala at the start of the MTN Elite One 2012. After being in and out of the team for a period, Mbarga Manga eventually found his form and he was simply brilliant during the second part of the season. Mbarga Manga scored at least three goals during the season, possibly one more. Mbarga Manga has been described as a midfielder, a left-winger and an attacker. As far as I know, Mbarga Manga is primarily playing on the left side of the attack. The birthdate of Mbarga Manga is unknown to me. Based on his performances for Cameroon U-20, I find it likely that he is born in 1990, 1991 or 1992. As this report shows, there is currently little information to find about Mbarga Manga. However, my intuition tells me that this is a player with a bright future in Cameroonian football. The picture of Mbarga Manga was found on uniondedouala.com.